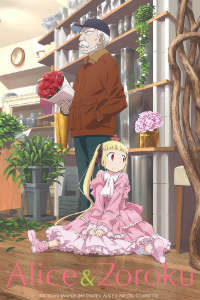 Distributor: Currently licensed by FUNimation. Also streaming on Crunchyroll. Notes: Based on manga by Tetsuya Imai, published in Tokuma Shoten's Monthly Comic Ryu. The show is 12 episodes, which includes a between-arc talk with the staff, and a first episode that lasts for 45 minutes rather than the regular 23. An elderly florist named Zoroku Kashimura encounters a hungry little girl who seems strangely naïve- and who possesses even stranger powers. The girl is being called the Red Queen (and has a tiny crown atop her head to prove it.) She enlists Zoroku in her efforts to remain free, and in particular avoid capture by The Facility, the place where she came from. The Facility enlists its inmate kids (and one adult) with comparable psychic powers- collectively, such people are called Dreams of Alice- to take back the Red Queen (whom Zoroku renames Sana) by force, even while Zoroku is trying to help Sana lead a normal child's life. By a rather convenient coincidence for the plot, Zoroku knows the very people in government who can help Sana fight against The Facility- whose ranks include a rather powerful Dream of Alice herself, one Ichijo Shizuku. (When working as a Dream of Alice Ichijo wears a costume that struck me as a cross between that of a maid, and that of a governess.) I won't deny that the action sequences near the end of this arc are exciting, but the ending seemed a bit abrupt- and left numerous obvious questions unanswered, which bugged me no end. Unfortunately, the second arc will do much the same thing. As broadcast, in between the first arc and the second the show does a story reprise ("clip") episode. While this has become, in my view, sadly common of late- this is so obviously a cost-cutting measure for the studio- in fairness Alice and Zoroku does put a little "value added" here by letting the voice actors present the clips, talk about their work on the show, and give a little preview of the second arc. This is the kind of thing that I wouldn't have minded at all as an extra on the DVD, but making it part of the show as broadcast...still strikes me as filler. Both story arcs chronicle Sana's increasing adjustment to society, and her increasing attachment to Zoroku and his granddaughter Sanae in particular. A running joke is that Zoroku is the kind of authority figure who can command, and RECEIVE, obedience from kids- even from the ones The Facility was employing to catch Sana. He "hates crooked stuff", as he says. And maybe even some of the Facility kids might be brought around, in time. Arc Two is mainly about a Dream of Alice kid named Hatori Shikishima who has no idea (at first) that there are others like her. She DOES know that she has this power to make others do her bidding; she also fears her parents are splitting up, and cannot resist the temptation to do something about that. Hatori has a best friend named Ayumu Miho who wants to help her, but doesn't know what to do either. The course of events ends up making it impossible to conceal the existence of the Dreams of Alice anymore, but again we have that perfunctory sort of ending that makes us wonder what happened afterward- in what would have been a difficult adjustment for literally everybody. Still, there is a sweet little coda that lets us know that things must have basically worked out OK, even if we didn't see any of the details. And while, as I said, I wasn't much of a fan of the character art, I DID like the closing song (called "Chant"). Recommended Audience: No fanservice. There IS some pretty shocking violence toward a child, however.